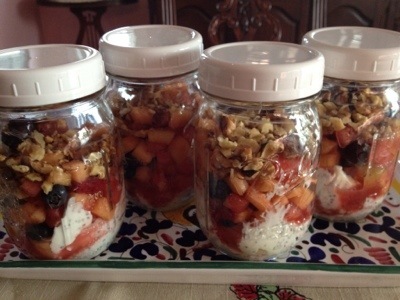 In yogurt container add Chia seeds and blend; divide among 4 Mason Jars (pint size). In medium mixing bowl add chopped fruit, honey and vanilla. Gently stir and divide among jars. Add chopped walnuts on top of fruit and cover tightly with lid.